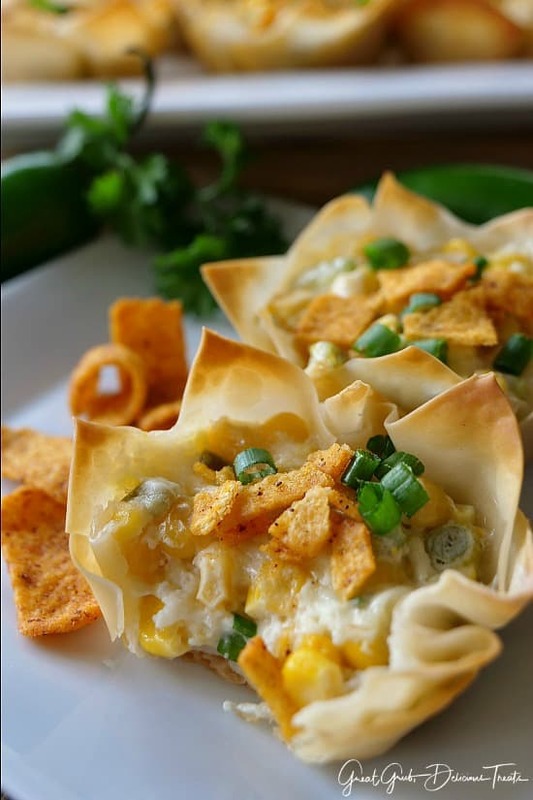 Each of these hot corn dip wonton appetizers are loaded with corn, cheese, onions, celery and jalapeños, baked in wonton wrappers, then topped with coarsely crushed chili cheese corn chips. Talk about delicious! These hand-held appetizers are perfect to add to the appetizer menu. 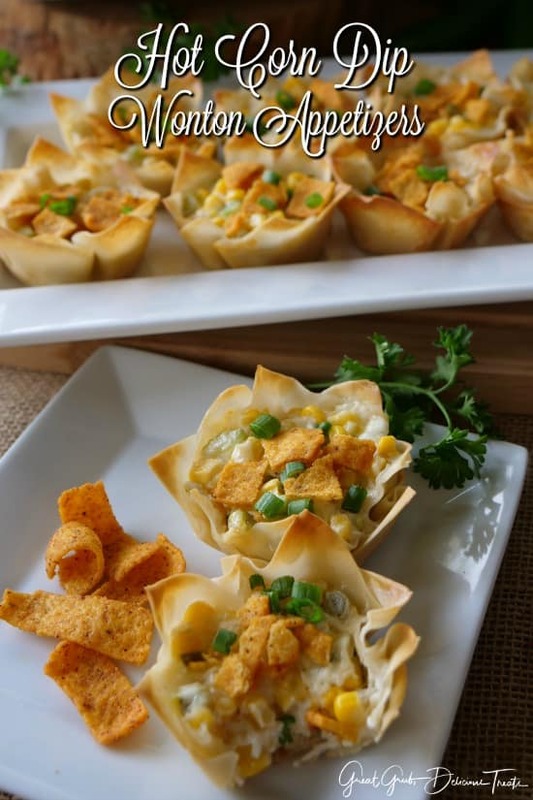 We are looking forward to the big game and love a variety of appetizers to serve our guests. 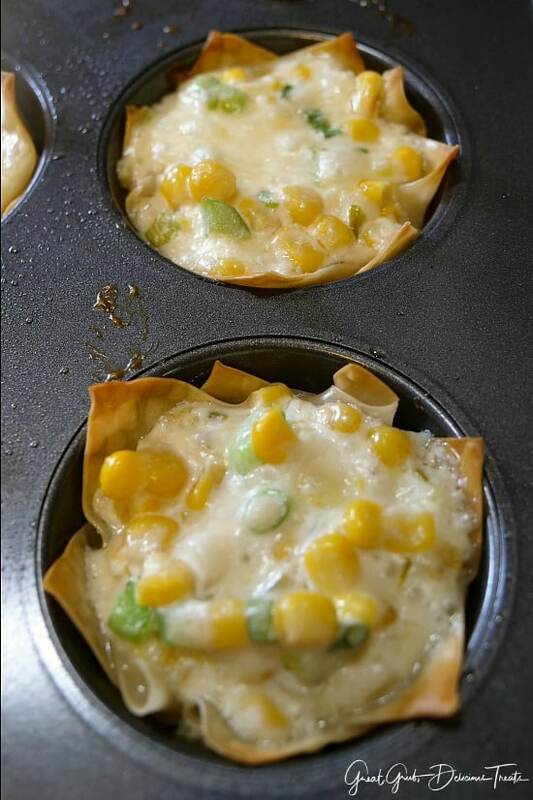 This recipe uses my hot corn salad for the filling. That recipe makes a great appetizer too. Make sure to check it out. Everyone who has tasted the hot corn salad just loves it. There’s just something about those crushed chili cheese corn chips mixed in. So good! 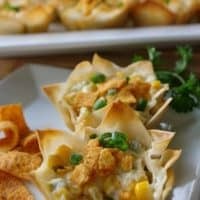 With this recipe, the little wonton hold it’s shape well and the corn filling comes out hot and bubbly, then add some coarsely crushed chili cheese corn chips on top and enjoy. Super yummy! These have just enough of a bite to them, and are not real spicy but the flavor is delicious. 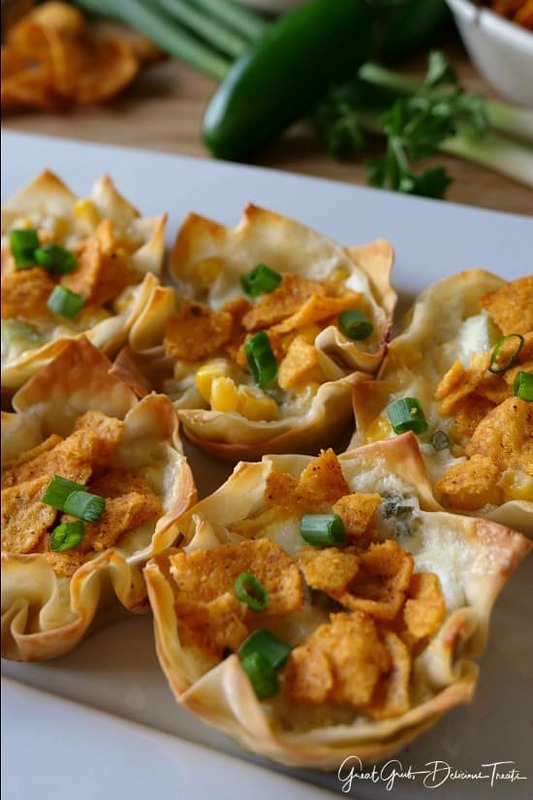 You can never have enough appetizers when planning a Super Bowl party. These are a hit every time. Make sure to check out all of the appetizers I have posted on the blog. I added a few at the bottom, so make sure to check those out too. 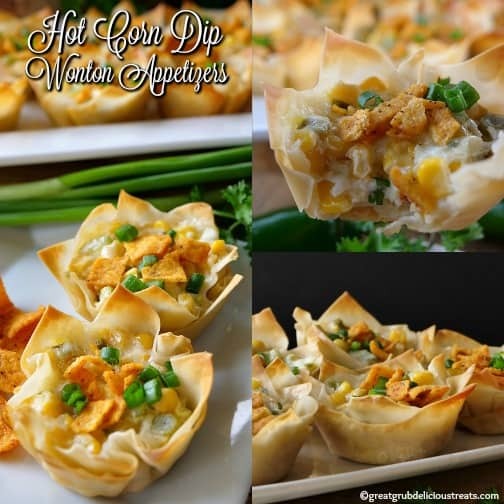 Crunchy, creamy and delicious is how I describe these hot corn dip wonton appetizers. Here are some other appetizers you can find on the blog: Hot Italian Sausage Pizza Roll Ups, Bacon Wrapped Stuffed Jalapeños, Crock Pot Little Smokies, and how about some delicious Parmesan Crusted Lemon Chicken Strips. A perfect appetizer everyone will enjoy! Preheat oven to 350° and spray 2 muffin pans with non stick spray. Set aside. Add drained corn, celery, onions, jalapeños, mayo and sour cream to a medium mixing bowl. Stir to combine. Stir grated cheese into corn mixture, set aside. 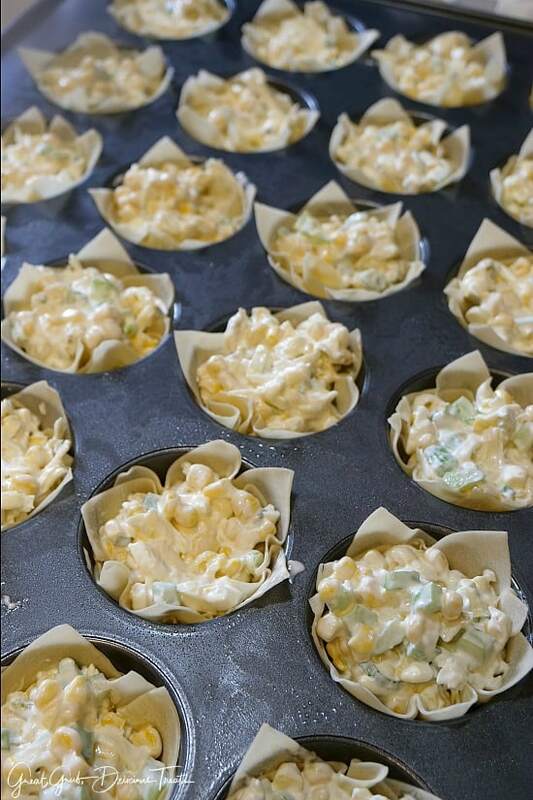 Take two wonton wrappers and lay on top of each other (making a star) then place into muffin pan. Continue with remaining wrappers. 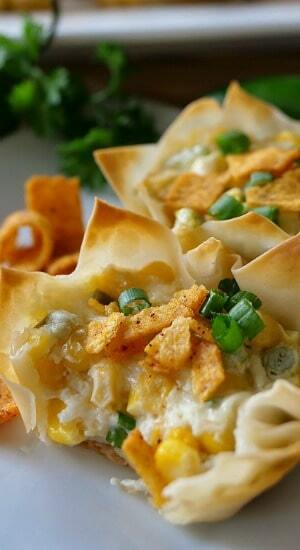 Add a heaping tablespoon of corn filling into each wonton wrapper. 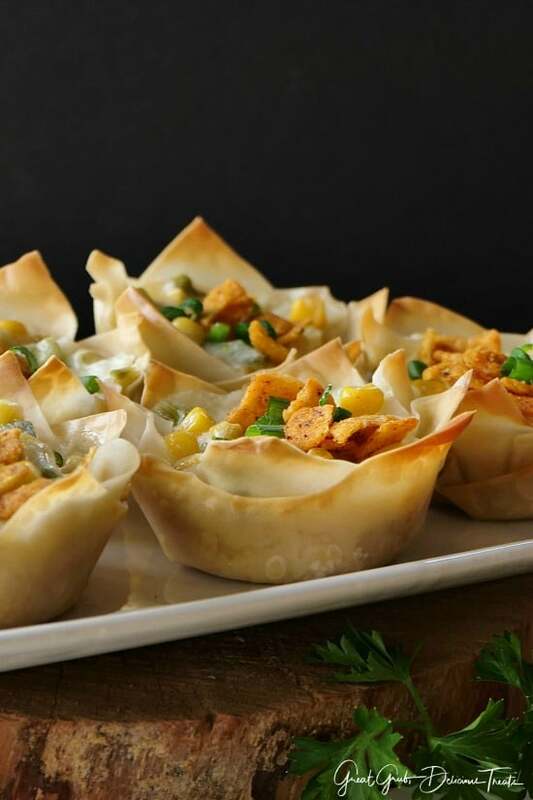 Once filled, place in oven and bake for 18-20 minutes or until each wonton is browned and filling is hot and bubbly. 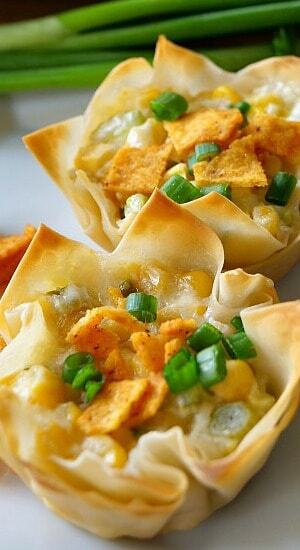 Remove from oven, add crushed corn chips to the top of each wonton and serve hot.